We believe the safety and efficacy of spray applications can be enhanced by managing factors in the tank, through the air and on the target. 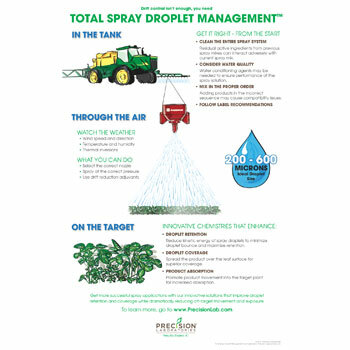 That's why we developed the Total Spray Droplet Management® education series. It highlights the importance of managing spray applications to protect people and the environment while maximizing product performance. We are pleased to offer the Total Spray Droplet Management® video series for Continuing Education Units (CEUs). Certified Crop Advisors have the opportunity to earn .5 credit for each of the videos below for a total of 3 credits. For those who do not wish to receive credits, please scroll down to view videos. Eliminates compatibility problems associated with tank mixing UAN solutions or suspension fertilizers with emulsifiable concentrates and flowable crop protection products. DERIVA is a water conditioning agent that protects the performance potential of glyphosate, dicamba and 2,4-D from antagonistic metal ions found in hard water and leaf tissue. Erase is a powerful spray system cleaner that exceeds the capabilities of ordinary tank cleaners. Erase emulsifies oily residues in sprayer lines and hoses while elevating rinsate pH to degrade vulnerable crop protection products. INTACT is a stand-alone drift reduction and deposition aid technology. INTACT can be used alone or in combination with water conditioning agents and other adjuvants to maximize on-target performance. INTACT XTRA is a convenient premix of drift reduction technology and water conditioning agents that minimize off target movement while protecting the performance potential of glyphosate and dicamba. NEXUM is formulated to enhance pesticide performance by improving spray solution deposition and coverage on targeted leaf surfaces while reducing driftable spray fines. Total Spray Droplet Management is a registered trademark of Precision Laboratories, LLC.